The Conviction of Cora Burns is a thriller set in 1880s Birmingham about a troubled young woman, Cora Burns, who uncovers the dark secrets in her past through an encounter with new ideas about Nature versus Nurture. Cora has always struggled to control the violence inside her. Does this temperament come from the mother she never knew, a convict who gave birth to her in gaol? Or is Cora a product of her harsh upbringing in the workhouse? Whatever the origins of her impulses, Cora fears that they may have led her, when she was herself a child, to kill a little boy. On her release, Cora finds herself working as a servant in the home of Thomas Jerwood, a gentleman-scientist obsessed with his study of heredity. Here Cora befriends a young girl, Violet, who seems to be the subject of a living experiment into upbringing and character. But are there two identical girls called Violet? And is Jerwood also secretly studying Cora? Then, when she finds a set of coins in Thomas Jerwood’s collection that are just like her own half-medal, Cora’s hidden past begins to unravel. Is she as cold and selfish as the man who now seems to be her father? And is she as vulnerable to madness as her mother who was also Thomas Jerwood’s servant and who has spent the past twenty years in the asylum? Cora’s turmoil culminates in the discovery that Alice Salt only ever existed in her own imagination. The crimes in Cora’s past are hers alone. But Cora realises that although her complex nature may be inborn, her grit is her own. With ingenuity and determination she finds a way to help Violet, and in doing so grasps an opportunity to create a hopeful future for herself and her son. Personality is not, after all, an unalterable product of biology and upbringing because Cora finds, in the end, the strength to change. 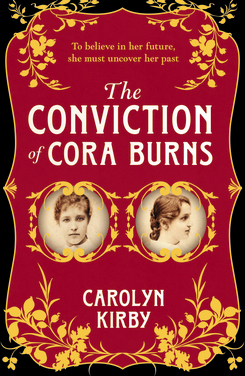 "The Conviction of Cora Burns is a striking debut. Rich in gothic darkness and period detail, the brutality of Victorian Britain is exquisitely drawn. A beautifully-written story which enveloped me from first page to last." "Kirby's talent shines through her deft prose...I think this is a fantastic novel from an incredibly exciting new voice. I think fans of Sarah Waters would love this bold debut." "An assured debut - atmospheric, dark and emotive. The story is sure to stay with readers long after turning the final page." 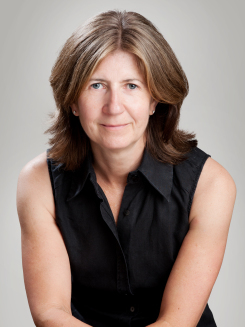 "Carolyn Kirby creates an unforgettable character in the spirited and fascinating Cora Burns. The voice transports us to the world of late nineteenth century Birmingham and we are drawn into Cora's dark mystery from the first page. A truly haunting and original début." "A poignant reflection on the possibility of personal redemption and the potential within each person and society, to recognize and cherish human dignity and shed the injustices of the past." "Carolyn Kirby is a born storyteller - a Charles Dickens for the 21st century." "Carolyn Kirby’s unforgettable debut is a painstaking, kaleidoscopic, deeply unsettling, deeply thrilling, expansive, provocatively masterful novel." "Kirby’s superb psychological thriller just about garrotes you in suspense. Is violence a product of nature or nurture? Can we shape who we are, and once shaped, can we ever change?" "A gripping historical thriller with a compelling protagonist. I loved the period detail and can't wait to read more from Carolyn Kirby." "Downton Abbey meets Elizabeth Gaskell." "An intriguing story of loss, doubleness, and sinister scientific experiment. Carolyn Kirby conjures up the nineteenth-century in a way that will surely satisfy all devotees of “Vic-lit." "In a novel that deftly illustrates so many social horrors, Kirby delivers a complicated picture of Cora that defies easy Characterization ... The suspicion and risk that permeate Cora’s few choices reveal the disproportionate power accorded to the wealthy and to men, even when their deeds display wanton inhumanity." "A fascinating and evocative journey through the heartbreaking secrets of Cora’s past, and a memorable exploration of nature versus nurture." "It’s an absorbing read, packed full of period detail and it’s great to read such an assured debut." "If you enjoy a historical novel with a gothic feel, with a strong heroine uncovering secrets from her past and one which makes you think about personality and heredity, then do try this….It is a gripping story, a haunting and original debut and full of period detail. Cora is a sympathetic and feisty character. Finding out about her crime and background give the story a strong narrative flow but I liked the addition of essays and scientific papers from Jerwood on his experiments in human nature. " "Kirby’s assured debut depicts the travails of a displaced daughter in Victorian England….the language is atmospheric and perfectly pitched, and the dialogue is spare and evocative.An ambitious effort that, despite its imperfections, will keep readers riveted. " Carolyn Kirby’s extraordinary debut novel Half of You has been selected as a finalist in the Mslexia novel competition. The book also won the Bluepencilagency First Novel Award, as well as being named runner-up in the Daniel Goldsmith First Novel Prize.